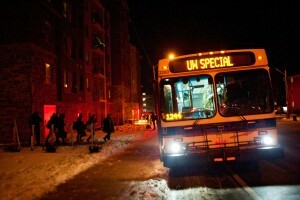 Students evacuate 21 Columbia close to 11 p.m. on Feb. 6. Unconfirmed initial reports suggested a fire on the fourth floor caused water and possible electrical danger. (Photo by Nick Lachance). Residents of 21 Columbia St. W were evacuated following a small fire in a fourth-floor unit, which set off alarms shortly around 8:15 p.m. last night. The fire was quickly extinguished, but according to tenants, the building suffered extensive water damage and flooding and possible electrical damage when the sprinkler system would not shut off. Just after 10 p.m. last night, the residents of the four-storey building — the vast majority of which are students — were told to gather as much as they could carry and board one of two GRT buses while the building was being inspected. One bus was set to take evacuees to the Wilfrid Laurier University Athletic Complex, the other to the University of Waterloo. As of just before midnight, most of the tenants were either staying in their apartments or had found other accommodations. According to reports, 15 tenants required emergency housing and were taken to UW and/or WLU. 12 of those tenants were students from UW. The fire was caused by an unattended pot on a stove in one of the units on the fourth floor of the the apartment and was extinguished by the sprinkler system inside the building before fire crews arrived. Tenants from the building noted that the sprinkler system did not shut off after the flame was out and the units affected suffered further damage from flooding. The estimated cost of the damage is $20,000.